Dark Horse Comics and BOOM! Studios deliver an action-packed crossover! Announced at Emerald City Comicon, Dark Horse Comics will publish a new Tarzan tale with the help of BOOM! 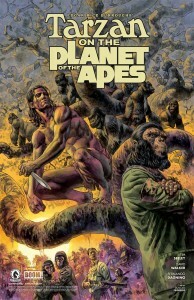 Studios, taking Edgar Rice Burroughs’s iconic hero to the Planet of the Apes in Tarzan on the Planet of the Apes! Heavyweight writers Tim Seeley (Revival) and David Walker (Power Man and Iron Fist) will script a five-issue miniseries with Fernando Dagnino (Suicide Squad) on interior art and Duncan Fegredo illustrating stunning covers, making this a crossover event readers won’t want to miss! “It’s a rare opportunity to get to work with two great properties, one great artist, and one hell of a cowriter, butTarzan on the Planet of the Apes does just that for me,” said Tim Seeley. In Tarzan on the Planet of the Apes, Tarzan and his ape brother Caesar, raised as brothers but separated by slave traders, reunite when the war between man and ape takes them from the jungles of Africa to the center of the Earth. “Planet of the Apes was crucial in sparking my imagination as a child, and remains my favorite film franchise of all time. The creative challenge of combining that world with Tarzan, and the opportunity to do so with a great cowriter, an amazing artist, and a supportive editorial team was an offer I couldn’t refuse,” added David Walker. This stunning crossover hits stands following the summer’s blockbuster film The Legend of Tarzan. Discover Edgar Rice Burroughs’s original superstar hero of the last century all over again at your local comic shop this September! Tarzan on the Planet of the Apes #1 (of 5) is in stores September 28, 2016. Preorder your copy today at yourlocal favorite comic shop.